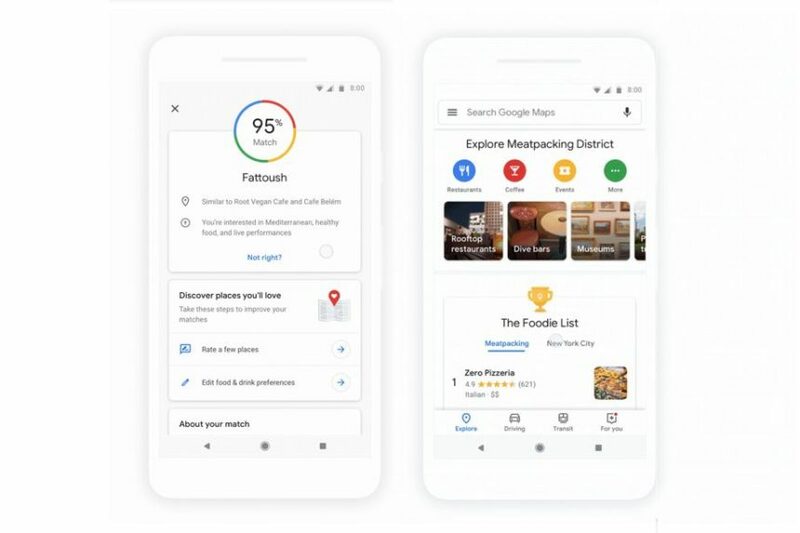 Google Maps can now offer personalized restaurant, event and activity recommendations, like Netflix recommends movies and TV. Google is trying to make your life a bit easier with an overhaul to its Google Maps app this week, introducing a redesigned Explore tab on iOS and Android. Announced at Google’s annual IO developer conference in early May, the update is one of several key changes Google has planned for Maps, including a much-needed improvement to the accuracy of the “blue dot” denoting your location, as well as an augmented reality Street View feature to help you follow directions in real time. Open the Explore tab in the updated Maps and you’ll be greeted with suggested subcategories — coffee shops, sports bars, live music venues, rooftop restaurants, etc. — but also other popular destinations in your area, such as events, activities or museums. The suggestions are appealing in their specificity, which might push you to try something new: Google’s example for New York City includes “Classic Literary Pubs of NYC,” “Best Go-To Thai” and “Photo-Worthy Donuts” in food, “Annual Arts & Crafts Festival” and “May Moonlight Marathon” in events, and “Roller Skating by the Lake” and “Interactive Story Time for Kids” in activities. Whether you’re out of town on business, looking for something to do with the family, or simply tired of the same old hangouts near your home, here’s what the new Google Maps can do for you. The update adds a “Trending Weekly” option and a handy “For You” tab, which functions like a newsfeed highlighting local restaurants, showing articles from Time Out, Grub Street, Eater and more, as well as spotlighting establishments that have recently opened. It’s a more one-stop shop for dining research. You can also “follow” certain areas you particularly enjoy, making it easier to keep up with places and events that may interest you and for new businesses to get the word out. The tab is a little sparse right now, but the feature is new. Google will be adding more content in the coming weeks. Perhaps most usefully, the app will offer personalized, location-based suggestions for food, drinks and events it thinks you’ll like. When you tap on a location, Google will offer up a percentage match, as well as more information about the location and other user reviews. Of course, because most of us don’t currently rate restaurants on Google Maps, you’ll have to initially teach the algorithm what you like by giving top marks to some of your favorites. You can do so by heading to the Settings tab within the app, select Exploring Places and hitting Food & Drink Preferences. As you select more places, the suggestions will become more accurate and reliable, just like your Netflix recommendations. If you keep your Location Services on all the time, the creepy-but-true reality is that Google already knows the spots you frequent, and it can start to recommend new places to visit based on that information. Still, rating your favorites will hone this further. If you just realized Google knows your location, here’s how to toggle Location Services by specific app for iPhone and for Android. This is a large update that pushes one of the better map apps into new territory, but it’s also a logical next step for the internet search giant. Rating, reviewing and recommending has previously been a space synonymous with Yelp, but when the time comes to punch in an address, you still have to resort to a different app. It appears Google is streamlining and centralizing the process in a way that couldn’t be welcome news to the team behind Yelp, but may work out well for consumers. Later this summer, Google will also introduce a social component to its Maps. You’ll be able to share several location options with friends, and they’ll be able to vote in real time so you can collectively decide without jumping back and forth between the app, internet reviews and a group message. If you liked hearing about Google getting an update, you might also like our Microsoft Gets a Facelift post. Feel free to check it out here.